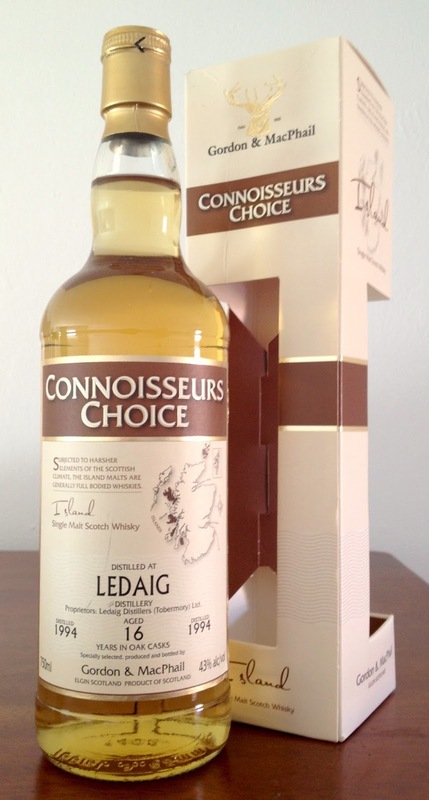 I like Ledaig a lot. While the younger refill casks haven't always tickled my fancy, the OB 10 Year from first-fill casks and the younger sherry casks have really done it for me. So I was fairly excited when The Party Source offered an older Ledaig at what appeared to be a rather reasonable price. This whisky was distilled in September 1994, filled into refill American oak hogsheads, then bottled at 43% probably with chill filtering in April 2011. Taste: bittersweet through out - balanced malt and oak with vague floral/fruitiness and vegetal funk peaking around the edges, becomes more overtly bitter at the back. After dilution the bitterness is tamed and it becomes rounder in a similar fashion to the nose, but falls a little flat after a while. This was, to put it mildly, not what I thought I was buying. Despite the convention that the distillery and most independent bottlers use, I'm pretty sure this was Tobermory's unpeated spirit, rather than the heavily peated spirit that is normally designated as Ledaig. And ultimately there's just not a whole lot going on in this whisky, maybe even less than what can be found in the OB Tobermory 10 Year. It's possible that the spirit would have been more lively at higher strength, but by the same token it might have just been too hot. And while letting it stay in the casks might have created further development, the balance of spirit and oak makes me think this could have gone over the edge fairly quickly. Sadly, they can't all be winners. The best use I can see this whisky being put to is either as a gentle way to ease someone into Tobermory's spirit or, more favorably, as a base for further blending. I found that a little bit of something sherried or peated gave it more pop and created a reasonably engaging whisky. But for a $60 malt that feels like damning with faint praise. Classic of Islay is a mystery malt. Bottled by Jack Weibers Whisky World in Germany, it has long been rumored that the source of the casks is the Lagavulin distillery. That would make them one of if not the only independently bottled Lagavulin on the market today. How this would be is a significant question as Lagavulin already sells very few casks to blenders, as the demand for the OB single malts already consumes the vast majority of their supply. Whatever the source, they have consistently delivered full strength heavily peated sherry cask whisky for prices that are a little hard to believe by the current standards of the industry. Let's see if it's too good to be true. This whisky was bottled in 2014 at 56%, without coloring or chill filtration. While this malt has faded somewhat since I first opened the bottle, it's still a very solid experience. The flavors could do with some more complexity, but the aromas and finish elevate it above the price point. Even if this is Caol Ila rather than Lagavulin, it's still quite a deal in comparison to the sub-10 year old Caol Ila single casks that have been hitting the market at over $100 lately. This isn't precisely bad, but the flavors really seems lacking in peat. While not overly complex, the aromas have some nice touches that tend towards the dry side, which is a nice change of pace for a sherry cask malt. At this strength the nose is nearly unpleasant, with strong chemical notes and little sherry to balance the youthfulness. The flavors are thin and somewhat indistinct until the finish, but generally inoffensive. Overall it feels like there are very good reasons for this cask to have been bottled at full strength - while I can't quite say that it entirely falls apart, much of the appeal is lost by diluting it this far. After trying a 9 year old first-fill sherry cask during the warehouse tasting at Lagavulin, I'm willing to say that this is at least in the same ballpark. There's a lot of overlap in my tasting notes, so even if that's not actually where it's from you're probably getting something that does a decent impression. With that said, it sounds like not every cask is a winner, but at least you won't be out a ton of money if you get one that isn't quite up to snuff. Over the last few years Glendronach has been bottling a huge array of single casks, usually either oloroso or PX sherry. Many have helped to reinforce their status as one of the premier sherry-driven malts in Scotland. Quite a number have been private bottlings for various stores and organizations, which include this one for WhiskyBase. This was distilled on September 20th 1995, possibly filled directly into a PX sherry puncheon, then bottled in August 2015 at 54.2% without coloring or chill filtration in an outturn of 694. I got a couple of samples as freebies in WhiskyBase orders (this may say something about how well the bottles have been selling). Nose: rich but somewhat subdued sherry, brown butter, vanilla, salted roast peanuts, fresh waffle cones, dark chocolate, fresh sawdust, herbal, rhubarb, orange, apricot, strawberry. After adding a few drops of water the cookie/waffle cone notes are amplified and integrate with the sherry, while the chocolate gets darker. Taste: big but moderately sweet sherry throughout, hints of malt underneath, kind of hot in the middle, shifts towards savory and bittersweet oak near the back. After dilution it becomes kind of flat but the alcohol heat is almost completely banished. I don't think there's anything particularly wrong with this whisky - it's a solid representation of the style - but it just doesn't excite me right now. It especially doesn't excite me to the tune of $150. The nose is easily the best part and offers some nice savory notes, but the palate is just too flat to justify the price. Reading reviews on WhiskyBase it sounds like a lot of other people agree. The fact that this is still available when all of the oloroso single casks appear to have sold out says a lot. It's possible that there are better Glendronach single casks out there, but given their exponentially rising prices I doubt I'll ever try any of them. Much like older Laphroaig, older Caol Ila is becoming hard to find, despite the absolutely gargantuan output of the Islay distillery. This is unsurprising as Diageo has largely cut off independent bottlers due to their own expanding requirements for peated malt. But every so often casks still slip into the marketplace that aren't astronomically expensive, despite the eye-popping price tags on even sub-10 year old Caol Ila right now. This whisky was distilled on January 24th 1995, filled into a hogshead, then bottled on September 30th 2015 at 54.4% without coloring or chill filtration in an outturn of 237 bottles for K&L Wines. Thanks to Florin for the sample. Nose: moderately strong oak, cedar, caramel, gentle sea air, soft Caol Ila peat, soft coal smoke, pine needles, creamy berries. After adding a few drops of water the aromas lose most of their oomph, leaving a washed-out nose that's mostly oak. Taste: moderate cask strength sweetness up front, quickly joined by a thick layer of oak with berry undertones that persists to the back, not overly tannic, with classic Caol Ila peat and pine dancing through the wood. After dilution the sweetness and oak become brighter, but the peat and berries mostly disappear until the finish. Looking at both the color of the whisky and the flavors and aromas, this was a relatively active hogshead. While less oaky than the 2012 unpeated release I recently reviewed, it feels like a toned down version of that with the peat added back in. While I think it's a solid cask and doesn't have any overt flaws, it doesn't really have the complexity that would have made me want to shell out $150 when it was available. I need to re-try them to be sure, but this doesn't seem to be bringing a lot to the table that can't be found in any of the official Caol Ilas for less money. For the last decade Diageo has been putting out annual releases of unpeated Caol Ila distilled between 1997 and 1999. Ages and casks have varied from 8 to 17 years old and from ex-bourbon, ex-sherry, and European oak casks. The 2012 release from from European oak casks and bottled at 59.3%, probably without chill filtration but maybe with coloring. Nose: heavy oak, caramel, ripe apples, sea air/salinity, dry malt, light creamy vanilla, berries in an almost sherried mode. After adding a few drops of water the oak and malt shift closer to balance, the salinity becomes savory yeast extract, more vanilla comes out, and the fruit notes mostly disappear. Taste: cask strength sweetness up front, strong oak and tannins come in right behind, apple and salty undertones throughout, fade out through bittersweet caramel and a touch of barrel char at the back. After dilution the sweetness becomes stronger and spreads out while integrating with the oak to give a brighter but more flat profile, and berries are added to the apples in the background to give an almost refill sherry character. In all honesty this whisky feels pointless. The oak dominates the spirit so thoroughly that it could be from practically any distillery in Scotland producing unpeated malt whisky. And while I can kind of detect some European oak character, it feels much more like first-fill American oak ex-bourbon casks. The 2010 release that I reviewed a while back was also oak-heavy, but not so much that it felt out of balance. If you happen to see a bottle sitting on the shelf at your local liquor store, don't bother. There are any number of cask strength whiskies out there that would be better for the same money or less. For a similar review, see Michael Kravitz's take on this malt. While Caol Ila aged over ten years seems to be getting kind of thin on the ground, Gordon & Macphail still have fairly deep reserves and regularly release it at more respectable ages. While the majority of these are vintage releases, this one simply has an age statement, more like their Macphail's Collection lineup. This whisky was aged in refill sherry hogsheads, then bottled at 46% without coloring or chill filtration. Nose: solid but not overwhelming Caol Ila peat, fresh tobacco, putty, lightly farm-y, wood ash, seashore, subtle oak, cedar bark, faint sherry in the background. After adding a few drops of water the the same elements are present but more muddled - the peat and oak integrate to become less well-defined - but peat becomes more vegetal than smokey, there is more sherry, and a touch of orange comes out. Taste: malt sweetness up front, a touch of berries and sherry in the middle, slowly fading into rising peat, tar, and moderate oak tannins. After dilution elements integrate - the malt and sherry come together in the front and middle, while the peat and oak integrate and spread out at the back. It was a bit frustrating to have to use so many "you're going to have to dig for it" adjectives for the notes beyond the peat, but this was a very subtle whisky in other respects. Whatever casks were used for this release were clearly well-used, because the cask influence in general is quite unobtrusive and any sherry is difficult to detect. With all that said, this isn't a bad whisky, it's just that you need to calibrate your expectations. While a little higher strength, this feels very similar to the OB 12 Year in terms of its punch. Also, don't expect much in the way of sherry, despite what it says on the bottle. And because of all that I would be disinclined to buy a bottle for more than the standard 12 Year as I don't think it has a lot more to offer.